If you plan to start your own business, work for a start-up or develop a career as a consultant to growing businesses, then you should seriously consider our new Master’s programme. This innovative one-year MSc in Entrepreneurial Consultancy and Practice (MECP) has been designed, with support from KPMG Enterprise, to develop your entrepreneurial skills, attitudes and behaviour. This will be achieved by providing opportunities for you to combine theoretical studies in entrepreneurship and business and with real work experience as junior business consultants. You will be working with a range of entrepreneurs, helping them to develop and grow their innovative businesses by identifying, researching and resolving the problems faced by most start-up businesses as they grow. As you will be representing the University of Buckingham and KPMG Enterprise in your external work, you will spend your first term developing your entrepreneurship and business knowledge and learning how to work as a member of a consultancy team. In your second term you will work on two consultancy projects. This will be followed by two more complex projects in your third term. During your final term you and your team must complete a major consultancy project for a larger growth business. You will also be given a chance to develop your own business ideas, working in teams during the first term, and at the end of the term you will ‘pitch’ the idea you have developed to our ‘Buckingham Angels’ venture capital panel. 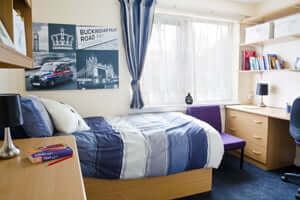 Why study at the University of Buckingham? The University of Buckingham is ranked 8th for Teaching Excellence 2019 and also the UK’s only campus-based independent university. It has been operating successfully for nearly 40 years without any Government funding by being innovative and entrepreneurial. Over the course of the programme you must complete 5 business consultancy projects, in teams of up to 3 people. The aim of each project will be to advise SME management about the best ways to develop and grow their businesses. This will involve you working with the owners and managers of a diverse range of SMEs and tackling business problems of varying complexity that are preventing growth. This degree has been recognised by the Chartered Management Institute (CMI). On successful completion of this course you will also receive a CMI level 7 Certificate in Professional Consulting. A CMI qualification better equips you for the professional world, giving you qualification that is highly sought-after in my employers. CMI is the largest professional body for Management in the UK with over 100,000 members. To find out more about CMI please click here. Prior to starting any consultancy projects, you will take introductory modules, to ensure that you are well prepared for your initial consultancy projects. To prepare you for increasingly difficult projects, you will be taught two additional modules in each of the following two terms and these will further develop your skills and knowledge. Facilitate a number of classroom-based sessions as part of the four training modules, including a session explaining to you how you would be expected to ‘behave / act’ in a place of work, in particular in a scenario where you may be seconded to work for a client. Use their existing network locally to recommend to the University possible companies for the Business School to contact about offering appropriate consultancy / intern roles for MECP postgraduates. Provide a mentor role to MECP teams undertaking business consultancy projects. The University of Buckingham is an active member of Enterprise Educators UK, the national network for supporting and developing enterprise education. The National Association of College and University Entrepreneurs (NACUE) is a national organisation that supports and represents university enterprise societies and student entrepreneurs to drive the growth of entrepreneurship across the UK. If you would like to discuss the MECP further, please contact the Programme Director, Nigel Adams. To be accepted on this programme you must have at least a 2.2 honours degree in Entrepreneurship or a business-related subject or must have passed the Pre-Master’s in Business. If you are not a native speaker of English then you must also have a minimum of 6.5 IELTS. You must demonstrate a serious interest in entrepreneurship and furthering the development of growth SMEs. You must also be willing to work in teams as consultants. This programme will be very hard work and may involve working outside normal university hours to achieve business deadlines. As numbers on this programme will be restricted, you will be interviewed in a similar way to KPMG Enterprise applicants. The Interview Panel will be the Chairman of ‘Buckingham Angels’ Venture Capital Panel, the MECP Programme Director and a senior representative of KPMG Enterprise. All postgraduate lectures, tutorials and workshops on business topics offered by the Business School to other Master’s students. Guidance and advice from lecturers in subject areas relevant to any business problems or concerns within your assigned consultancy project, provided in arranged appointments. Teaching advice, guidance and mentoring from University staff with experience in business consulting. Training, guidance and coaching from external professionals such as KPMG Enterprise staff and management. In the Overview of Business Functions module you will work in teams to identify and develop ideas for a business and pitch it to ‘Buckingham Angels’ in the last week of the first term. Your pitches and business models will be assessed. A set of case files prepared for each business consultancy project in which you must explain and report the situation you have identified and the recommendations that you as your team made. The files should include a rationale for your recommendations based on your research and other relevant factors. You must also produce an individual reflective journal or ‘learning log’, completed every week, which will be continuously assessed throughout the whole programme. Finally you and your team will be assessed on your Team Presentation to the management of the SME client company and your Team Consultancy Report. See the Business Curriculum Handbook for further course details. On graduation from this programme you could be in a position to start your own business or you might want to gain more experience by working for a start-up, perhaps even one of the companies that you had worked with as a junior business consultant during the programme. You could also develop a career as a consultant to growing businesses with a range of firms, as you will not only have a Master’s degree, but also the experience of several consultancy projects under your belt. The tuition fees quoted below are for the degree (e.g. if you start a degree at Buckingham in January 2018, you will pay the same termly fee for the duration of your degree – you will not be affected by the price increase in September 2018). Fees are normally paid in termly instalments. A first-class scholarship is available to both home and international students following a taught postgraduate degree at the University. The scholarship will reduce tuition fees by 33%. The scholarship will be automatically awarded to applicants who already have a first class honours degree that is recognised to UK standard. Details of other scholarships can be found on our main Bursaries and Scholarships page. You should make an application to study at the University and receive an offer letter confirming our acceptance of your application before applying for a scholarship.